You want to talk about Super Smores? 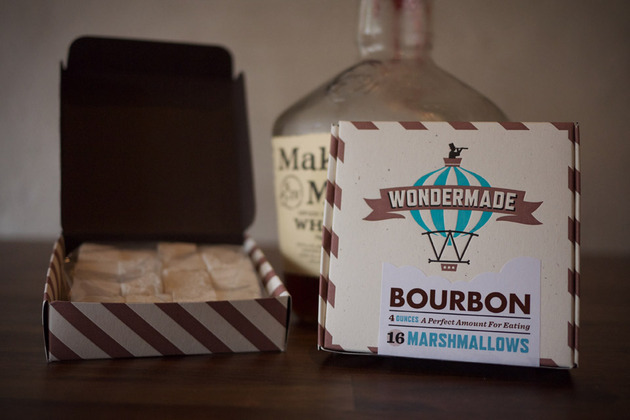 Best be making them with some of these Wondermade Bourbon Marshmallows. Soaked in Maker’s Mark, these boozy sweets are sure to add a spark of unexpected flavor to whatever treat you put them in. Perfect for fooling unsuspecting in-laws over the holidays. If the hard liquor isn’t your thing, they also offer Guinness, apple cinnamon, cranberry, pear, and pumpkin pie flavors. Glaucus atlanticus got quite a bit of attention on the internet in April after a stunning up-close photo was posted to imigur. While we only just stumbled upon the blue dragon today, the moment we saw it we had the feeling this wasn’t the first time we had seen a sea slug that looked like something out of a fantasy world. Emergency services rushed to a suburb of Stockholm after reports of a gas leak – only to find a bucket of fermented herring. Two fire engines, two police cars and an emergency gas leak team all rushed to the investigate the reports in Sodermalm, reports The Local. They had been alerted by concerned neighbours who thought they smelled gas in the stairwell, but it turned out to be something less dangerous. The strong smell came from fermented herring, or surstromming, a notoriously foul-smelling Swedish delicacy traditionally served at autumn parties. “I guess somebody didn’t know what surstromming smells like,” said Sven-Erik Olsson from the police’s command centre.